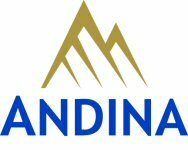 ANDINA Minerals Inc. (TSX VENTURE:ADM) ("Andina") has announced today that it has entered into an agreement with a syndicate of underwriters led by BMO Capital Markets, under which the underwriters have agreed to buy on a private placement, bought deal basis, 8,000,000 Units (the "Units"), at a price of $3.00 per Unit for gross proceeds of $24 million. Each Unit consists of one Common Share and one-half of one Common Share Purchase Warrant (the "Warrant"). Each whole Warrant entitles the holder to purchase one Common Share at a price of C$4.00 on or 30 months from closing. The offering is expected to close on or about February 9, 2007. Closing is subject to receipt of all required regulatory and third party approvals and consents, including the approval of the TSX Venture Exchange. The TSX Venture Exchange does not accept responsibility for the adequacy or accuracy of this release. About this company ANDINA Minerals Inc.